Emax BL5335 KV230 Brushless MotorFor Planes weighing 5kg to 10kgPackage Includes1 x brushless motor1.. The maximum motor speed can reach 210000 RPM (for 2-pole), 70000 RPM (for 6-pole) and 35000 RPM (for 12-pole). Multiple flight modes: Airplane Fixed Wing / Heli Governor Off / Heli Governor (Elf) / Heli Governor Store. Adjustable throttle range, compatible with various transmitters. Brand new governor program brings excellent speed-governing effect. Compatible LCD program box (optional accessory), its simple and visual interface allows users to set/revise all the ESC parameters easily. Upgradeable firmware, you can upgrade the ESC after connecting it to a PC via the USB cable on the program box. transmission module, it can make the real-time data monitoring and logging possible. 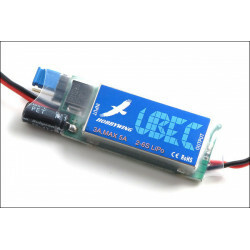 Low-voltage cutoff protection / Throttle signal loss protection effectively prolong the service life of the ESC. The anti-spark circuit on the input wires eliminates the electro spark created when connecting the battery pack to the ESC.